1. First, make the chilli salt. Put the chilli and garlic into a pestle and mortar with half of the salt. Pound together until you have a bright red paste and there are no whole pieces of chilli left. Stir in the remaining salt then spread out on a large plate and leave to dry for about 2 hours. 2. Meanwhile, slice the squid into thin rings and combine with the buttermilk in a large bowl. Cover and chill in the fridge for 30 minutes. 3. In a deep pan, preheat the oil for deep frying to 180°C. Combine the flours in a large bowl and season with plenty of salt and pepper. Drain the squid from the buttermilk, shaking off any excess, then dredge in the seasoned flour. Fry in the oil in batches for 2 minutes until golden brown, then drain on kitchen paper. 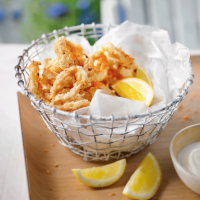 Season with the chilli salt and serve with lemon wedges and garlic mayonnaise.